As January is School Board Member Recognition Month and this week marks the 20th anniversary that Searcy School District lost one of its beloved school board members, Searcy School District administration thought it appropriate to recognize Ms. Wanda Wilson for her service and dedication to Searcy Public Schools. Ms. Wilson perished in the tornado that ravaged White County in 1999. Ms. Wilson truly enjoyed all school activities, and she made it her mission to study school board business and ensure the board made the best decisions for the students and staff members of Searcy School District. 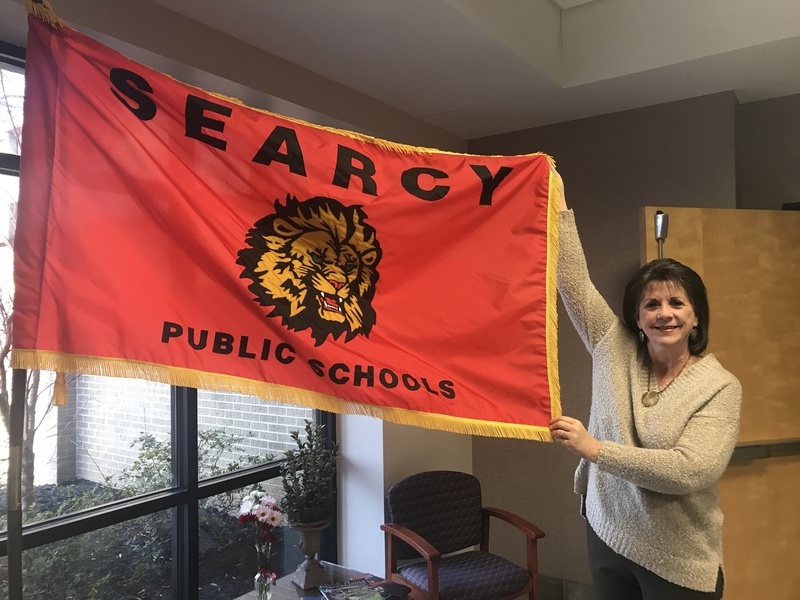 A constant reminder of Ms. Wilson’s love for the district stands in the administration office lobby as she was instrumental in the gifting of an official Searcy School District flag. Members of the Searcy High School classes of 1947, 1948, and 1949 provided this official district flag. Searcy Public Schools are also happy that we are able to fund a scholarship in her name from the funds set aside from the Coca-Cola beverage contract. 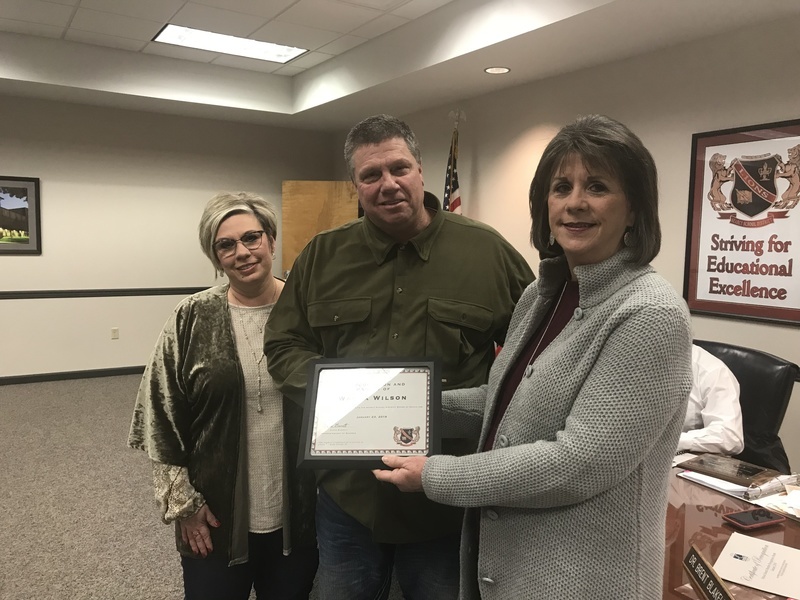 In honor and memory of Ms. Wilson’s service to Searcy School District and in recognition of School Board Appreciation Month, Superintendent Diane Barrett presented Wilson’s son, L.V. and his wife Danielle, with a certificate of appreciation at the January school board meeting. Barrett also thanked the Searcy School District Board of Education for its service to Searcy students. She read a state resolution recognizing Board Member Appreciation Month and presented each member with a certificate of appreciation. 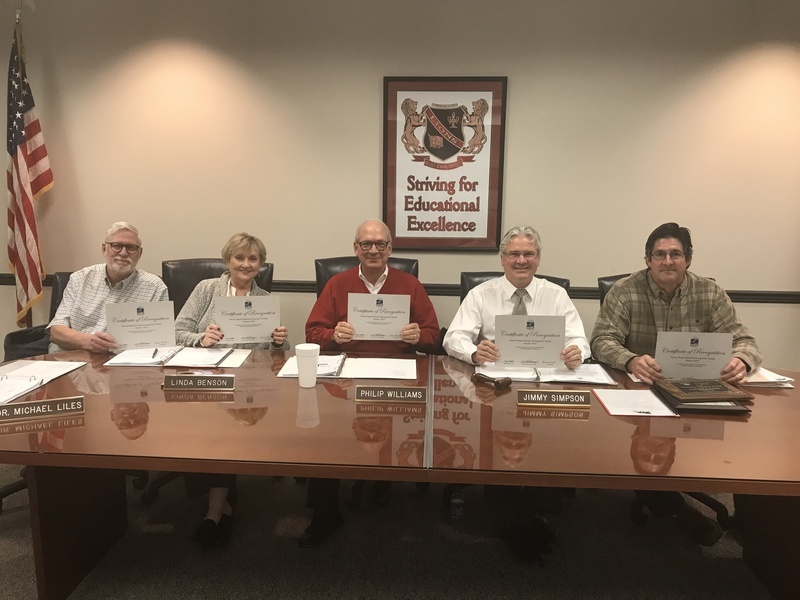 Searcy School District Board of Education members include Jimmy Simpson; president, Philip Williams; Vice-President, Linda Benson; Secretary, Dr. Mike Liles; member, and Dr. Brent Blakely; member.